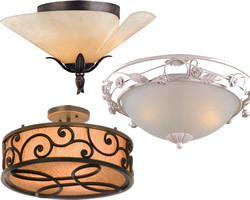 These ceiling light combine elements from historic sources to coordinate with your formal or traditional home. These close-to-ceiling lights and Semi-flush lights combine gentle diffusers on frames finished in iron, gold or silver finish in patinaed metal or painted finish. A variety of beautiful ceiling lights dressed in crystal. A beautiful accent for a traditional interior. Less traditional, contemporary and modern crystal ceiling lights to coordinate with today's interiors. Natural Alabaster Ceiling Lights coordinate with a variety of styles. These beautiful natural ceiling lights stand the test of time and never go out of style. This collection of ceiling lights coordinates with your Art Deco style home. Ceiling Lights in Adirondack, Craftsman, Lodge, Mackintosh, Mission, Prairie, Shaker Style or Tiffany Style Ceiling lights. 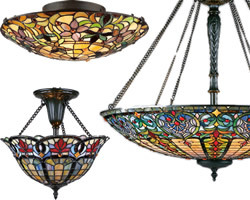 Stained glass and tiffany ceiling lights from Quoizel, Kichler and more. These ceiling lights will coordinate with your Art Nouveau room. For lower ceilings these contemporary ceiling lights fit close to the ceiling. Contemporary Ceiling Lights coordinate with with today's casual interiors. Cool, sleek and sophisticated or casual and comfortable, these ceiling lights will enhance your interior. With a wide variety of metals, finishes and diffusers, these contemporary Ceiling Lights coordinate with with today's casual interiors. Brushed finishes with sleek design lines are characteristic of this style. These larger ceiling lights are ideal for hospitality and settings, kitchens and other large rooms. Creative and unusual ceiling lighting. Whimsical, fun designs from Eurofase, PLC, Van Teal, Zaneen, Leucos Goccia, Eurofase and more. This collection has sparkling crystal prisms and drops, making these ceiling lights an instant focal point. There are two pages of Modern close to ceiling, flush ceiling lights. They are an excellent choice for lighting closets, hallways, foyers and bedrooms. Modern Ceiling lights feature chrome, brushed steel and other finishes with frosted or clear glass to light your foyer, hallway or bedroom ceiling. These ceiling lights either coordinate with rustic interiors with rustic diffusers and finishes or have rustic motifs. Beautiful in your lodge or cabin or give a rustic feel to any home. These ceiling lights coordinate with a traditional interior. 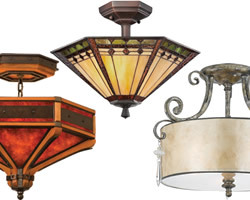 Similar to Antique Reproduction lights, these are a little more transitional. Combine an effective light source with high style. These more casual ceiling lights fit in with any decor. Blending the best elements of Contemporary and Traditional, Transitional lighting brings sophistication to formal or casual settings. Lower priced ceiling lights that work with a variety of interiors, from traditional to contemporary. Transitional style combines the contemporary and traditional. This collection of ceiling lights inspired by familiar traditional styles. Glass Ceiling Lights that fit close to the ceiling. Available in a variety of styles, colors and glass. From very inexpensive choices to Venetian glass and hand blown art glass. Frames in a variety of metals and finishes suspend glass from sources around the world. Beautiful lighting at a variety of price points. Flush and Semi-flush mount ceiling lights in Satin Nickel or Bronze metal finish with a wide variety of glass and paint finishes. High style meets low energy use in the sophisticated collection of LED ceilng lights. Ceiling mounted spot lights are available in a variety of finishes. Some feature glass shades. Contemporary, modern, transitional and functional wall or ceiling mounted spot lights from Holtkotter, Tech Lighting, Access, Nulco and more. Track lighting is an excellent choice for ceiling lighting. The variety of track heads make it easy to make changes in your lighting. You can mix pendants and track heads to direct light on specific areas. Low-voltage cable system creates the illusion of floating lights. Two cables are stretched across the ceiling carrying low voltage electricity. Lights clip to each cable to provide beautiful and functional lighting.